Unscramble words and other word scramble games are a great way to practice word recognition skills (not to mention spelling.) Besides being fun, they help you get more familiar with common patterns in English words. 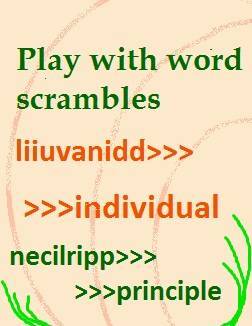 The scrambled word games here let you practice some of the most common words in academic vocabulary—words from Level 1 of the Academic Word List (AWL). The AWL includes the 570 most common academic words in a variety of academic texts. (It doesn’t include words from the General Service List-- the 2000 most frequent words of all.) Level 1 gives the 60 most common words of the AWL. Each game is on a separate page because of the interactive game code. You can reach any of them from this page. The first three sets of games are arranged by type of word to make it easier to guess. If you want a more difficult challenge, choose games from the mixed group. Each sequence has 5 games, except for the adjectives with 6. This page has the first game of the AWL Adjective Words. If you prefer to play the Mixed Words, AWL Nouns, or Government Words, just click the link below this game to start that sequence. Instructions: Click on each letter in the correct order to form a word. (You can undo one letter at a time if you decide to change it, or just click 'restart' to begin anew.) When you think it is right, click “check” to check your answer. If you need help, click on “Hint” to learn the next letter. Then just click the link to the next game you want (or from other games, return to this page to find another game.) Have fun! A hint for the word scrambled below: it means fitting or proper. , Game 3, Game 4, Game 5, Game 6. These words to unscramble can be very difficult if you have no idea which words are included. So I've given lists of possible words below. I didn't want to make it too easy, so I included extra words and did not separate nouns and adjectives. Besides, it's very useful to understand the suffixes that make words into nouns or adjectives. That's why I added a quick explanation below the lists. If you already know all this-- great! If not, it is worth a little time to study it. It will help you when you read, and especially when you need to choose the correct form as you write. Nouns very often end in -ion or -tion, as well as –ance, -ancy, -ence, or -ency, -er, -ism, -ity, -logy, -ment, -ness, or -ship. For other ways to practice vocabulary from the AWL, see Vocabulary Games, TOEFL & IELTS Vocabulary, or ESL Quizzes. Home> Vocabulary Games> Unscramble Words.